Things haven’t changed much in the AFC West. Whether that’s good or bad depends on your point of view. To go with our 2016 NFL predictions, FiveThirtyEight is previewing each division. There are a lot of things Elo doesn’t know. Coming into the season, it didn’t know that the Broncos lost their Hall of Fame quarterback and replaced him with the most deliberately uncertain QB situation we’ve seen on a contender in recent years. After Thursday night, it didn’t know that Denver escaped with its Week 1 win thanks to a missed kick in the waning moments and a night of Panthers QB Cam Newton taking illegal hits that pretty clearly sapped the life out of him in the second half. It just knows that the Broncos were a fabulously good team last season, and they beat a very good team in Week 1. And actually, that might be all it needs to know. “We feel like we don’t care if George Bush was playing quarterback — we’re going to win because you can’t score,” says safety T.J. Ward. “You can’t score, you can’t win. That’s our mentality. This would obviously be a different story if Peyton Manning had provided more production last season, but he was terrible, so Elo’s blind spot was mostly about whether Siemian could hang against a good NFL defense. A lot of things go into an NFL team’s fortunes, enough that outside of a seismic catastrophe at the quarterback position, there’s a good chance a team’s fundamental level will carry over from year to year, with less regard to offseason moves than fans might think. Now that we know Siemian isn’t a lump, we have a pretty good idea what the Broncos are as well: the same terrifying defensive team as last year, just with George Bush lining up under center. You know what else Elo doesn’t know? The crushing, numbing experience of an Andy Reid playoff meltdown. Three seasons ago, Reid’s Chiefs blew a 28-point lead to Andrew Luck and the Indianapolis Colts in the wild-card round. After going 9-7 in 2014, the Chiefs sprang to life in the second half of 2015 and entered the playoffs as one of the hottest teams in the league. With their win in the wild-card round, their Elo rating spiked to 1699, the highest it’s been since they beat the Vikings in the 1970 Super Bowl. And then, of course, disaster. Trailing the New England Patriots 27-13 with six and a half minutes remaining, the Kansas City offense snapped off a five minute, 16 second 16-play drive to get within one score. It was astonishing and horrifying to watch it play out in real time, and all too familiar to anyone who’d watched Reid’s Philadelphia Eagles over the years. It’s conventional nerd wisdom that results in close games are a matter of luck, not skill, but that refers to the generic scoreline — “games decided by 7 or fewer points” or whatever cutoff you like. There are, in fact, diagnosable maladies for teams, such as having difficulty stringing two scoring drives together in a short period of time. For teams with such issues, the saving grace has been the corresponding maxim: Good teams don’t play close games; good teams win in blowouts. But what comfort is that to a fan base that was only just recovering from somehow losing a playoff game it had been winning by four touchdowns? To Elo, the Chiefs lost two close playoff games to two very good teams and come into 2016 as the fourth-strongest team in the league. This is a good team with a very good chance of making the playoffs. If they do, we’ll know a good bit more than Elo does about what’s waiting in store. The Chargers were bad last season. The team went 4-12, ranked 24th in overall team Defense-adjusted Value Over Average (DVOA) and 28th in defensive DVOA, and finished the season with its lowest Elo rating since the 2004 draft in which it acquired Philip Rivers. The Chargers haven’t bought themselves much leeway off the field. After holding fans hostage all of last season, playing what many thought would be their final game in San Diego, they ended up in a madcap push to drum up support for a hugely unpopular $1.8 billion stadium/convention center proposal. If (when) the vote fails, the Chargers will have to decide by January if they’ll move to Los Angeles. In the meantime, the team chased off Eric Weddle, one of its best defensive players, and turned the good fortune of getting Joey Bosa — by many accounts the best player in the draft — into a sideshow. The Chargers engaged in an all-out assault on Bosa over contract provisions that are standard practice with every other team, which resulted in a 31-day holdout by Bosa. Elo predicts that the Chargers will see six to seven wins this season. That’s a little ungenerous, considering the number of injuries the Chargers have had the past few seasons (and with the re-addition of Ken Whisenhunt as offensive coordinator potentially jazzing up the passing game), but generosity is hard to come by after an offseason like San Diego’s. The other team trying to pack up and leave town is, shockingly, in considerably better condition than San Diego. With Derek Carr and Amari Cooper, the Raiders have a proven backbone of a functional offense for the first time in a decade. And the defense, which finished the season in the bottom half of DVOA, came on late, with negative ratings (on defense, that’s good) for the final six games of the season. Things are looking up for the Raiders. Unfortunately, they’re looking even upper for the rest of the division. 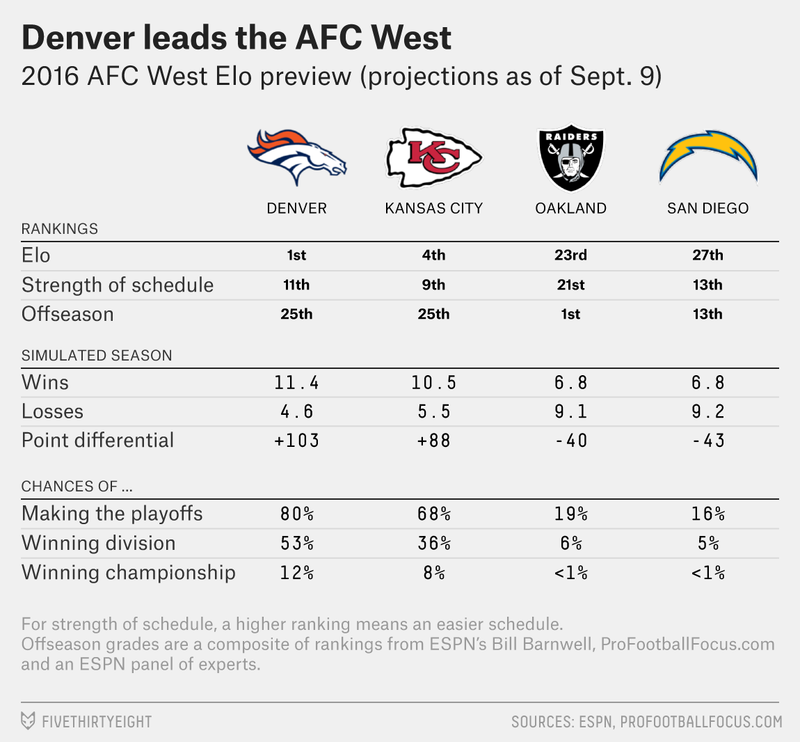 The AFC West is stacked, and Elo gives Oakland just a 19 percent chance of making the playoffs, with 6.8 projected wins. And that seems about right in the cadence of the NFL — it’s the inverse of the Broncos, in a way. The foundational elements of a good team are all here, but it takes a long time to stock a roster with the talent needed to contend at the highest rungs.